Mary is a busy working Mom with 3 grammar school aged children and a husband. The family became stressed out anytime they went into the pantry — for snacks, to feed the dog, to get food to prepare meals, to get cleaning supplies--because it was so crowded with items on the shelves and drink bottles (bottled water, beer, soda) on the floor. Mary and I started the process by taking everything out shelf by shelf to discover if any items were expired and put them in the trash. We then grouped items by category. 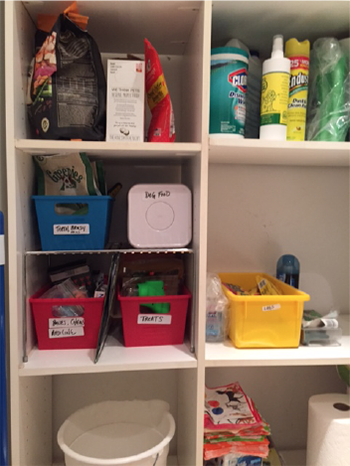 We used red plastic containers from a dollar store in the wire pull outs previously crammed full of food items. Taking snacks out of their boxes and labeling the red containers made it easy for the kids to get an after-school treat. Each shelf contained a similar category of food, making it easy for Mary to know what she had, and helped her to know where to replace items after a visit to the grocery store. Since she bakes a lot, we put small baking items like sprinkles, vanilla, frosting tubes in a container. It’s easier to reach and more efficient to pull down a categorized container than dealing with loose items. 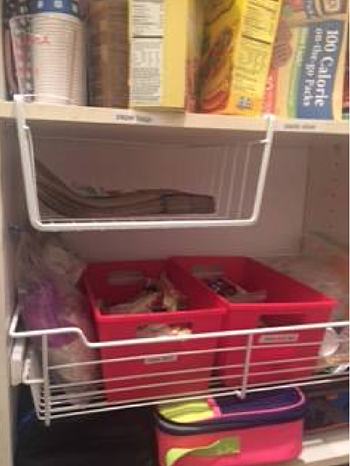 We used Under-the-Shelf wire baskets to take advantage of all the wasted space above the red baskets storing paper plates and napkins for easy access for on-the-go meals. For the dog area, we used a Cabinet Shelf to take advantage of the vertical height. We got FOUR vs TWO containers in the space Mary had loose items all thrown in together saving her time finding what she needed for the dog. 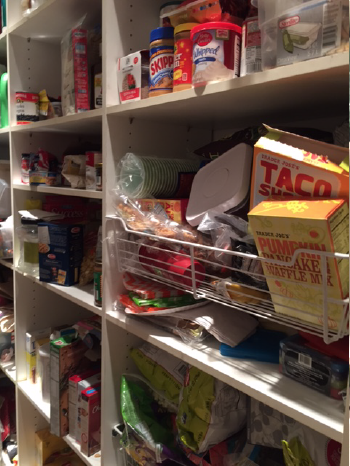 All in all, this pantry has systems the entire family can maintain and Mary’s life is much less stressful.